in St st on larger needle; 18-st cable panel = 3 1/4" wide. 18 3/4 (20 1/4)" brim circumference, 21 1/4 (23)" circumference at widest point, and 9 3/4" tall. 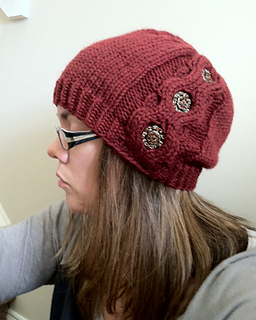 Hat shown in smaller size. -Finished Size: 18 3/4 (20 1/4)“ brim circumference, 21 1/4 (23)” circumference at widest point, and 9 3/4” tall. Hat shown in smaller size. 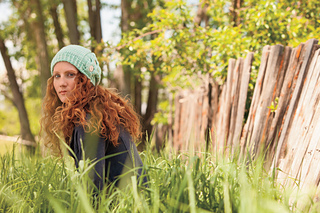 -Yarn: Malabrigo Chunky (100% pure merino wool; 104 yd 95 m/3 1/2 oz 100 g): #83 water green, 2 skeins. -Needles: Ribbing—size 7 (4.5 mm): 16” circular (cir). Body—size 10 (6 mm): 16” cir and set of double-pointed (dpn). Adjust needle size if necessary to obtain the correct gauge. -Notions: Markers (m); cable needle (cn); tapestry needle; three 1” buttons. -Gauge: 14 sts and 20 rows = 4” in St st on larger needle; 18-st cable panel = 3 1/4” wide. 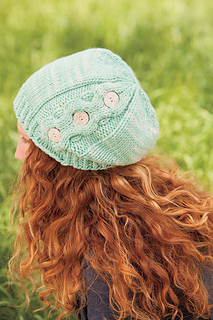 The chunky cable in this hat makes the perfect frame for three special buttons. This quick project is easy to personalize- just choose buttons that reflect the recipient’s taste!